with devotion: Prayer Answers: Yes, No, Wait? Prayer Answers: Yes, No, Wait? I don't believe prayer is ever "unanswered." Maybe it's just a matter of semantics, but God ALWAYS listens and answers - He just doesn't always give us the answer we want. If we don't get what we want, then we must trust that what He DOES give us will be used to for His glory and our good. Not easy to do, but it's what we are called to. Here are my thought on that Bob, I went through a very difficult time not so long ago...I wanted it over with in a flash and I got down on my knees and begged. I had heard in sermons that there were people that had their prayers answered in a moment...and I asked why...am I not as loved as they are? And after I fought my way through with Him by my side I found out that it was because I wouldn't have learned the lesson that I was supposed to learn. Many I have learned in the past four years. Thank you Lord for teaching me. As always, I love your writing. I think for me, I've always looked at "unanswered prayer" as the answer. I don't know...I'm not sure think of it so much as an unanswered prayer. I think sometimes no answer is the answer. Maybe it's our own lack of not being able to see it as an answer. And sometimes it's a matter of timing. The answer comes not when we want it, but maybe when we need will need it the most. After all, He sees what's ahead. Timing is what it is all about.... When the student is ready...the teacher will appear!!! This passage speaks to me of the persistence that we so need when we pray.. often we see this persistence on display in the scriptures.. certainly the seeking and knocking prayers are not just a one time events. I do think that the Holy Spirit can speak to us and tell us "no" as He did with Paul.. but until He does isn't it a good idea to keep praying and understanding that the answer may be "wait"? 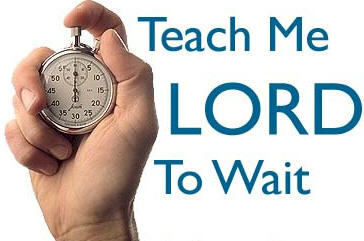 And really.. isn't a "wait" answer just another way to describe an unanswered prayer? I would love to hear what you think. I believe we have to keep asking and seeking. He says, "When I return will I find faith upon the earth." Since "Faith is the evidence of things not seen......." this speaks to me to keep on being persistent and remain in faith believe we will have what we have not yet seen, until........as you say we get a loud NO or the door is absolutely closed as in death. Then we won't have to stand in faith because we will have it all and no tears!!!! Are any of you suffering hardships? Willful proud ... Willing humble.